Everyone deserves to have a laptop that they can use in a coffee house without shame, carry to classes without pain, or use to tweak a few photos on without frustration. To that end, I’ve been spending a lot of time with some of the best laptops under £1,200. The goal was to find the perfect inexpensive laptop. Something almost as excellent and well-designed as a MacBook Pro or Razer Blade Stealth, but without leaving quite as big a dent in your wallet. Out of a field of eight laptops (HP was unable to provide a competitor in time for this story) four had to be eliminated pretty quickly due to failure to meet the criteria of a perfect laptop. 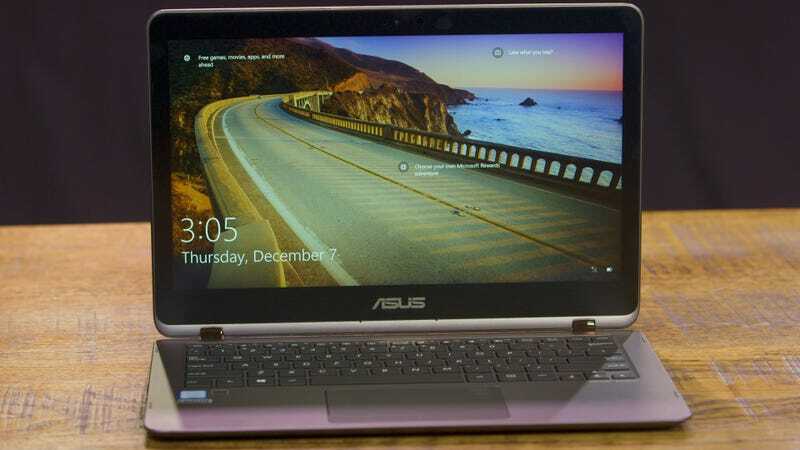 First, the laptop needed to have at least a 7th generation Intel processor or newer. So Apple couldn’t field a challenger. It only has one laptop for under £1,200, the Macbook Air, and that has a three-year-old 5th generation processor. So if you want MacOS you’ll need to sacrifice speed (and resolution—the Macbook Air’s display is just 1400 x 900). The currently available Samsung Notebook 9 was excluded for similar reasons. 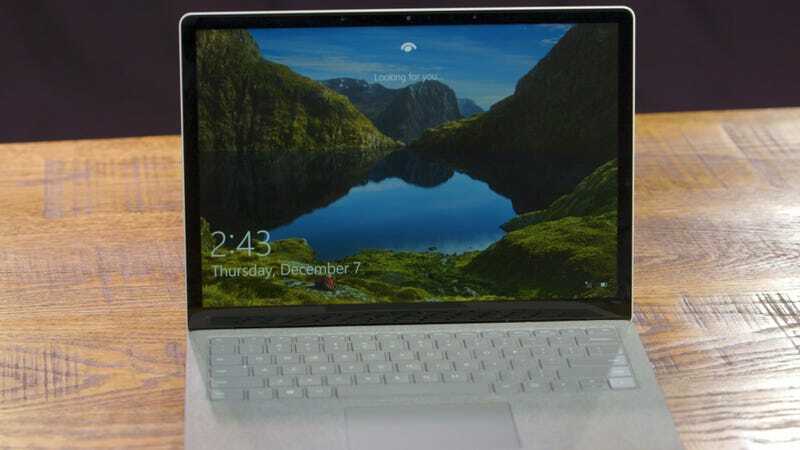 The Microsoft Surface Laptop’s resolution was actually one of the highest found in this price range (13.5-inch touch display with 2256 x 1504 resolution), but only one version of the Surface Laptop is sold for under £1,200, and it has a measly 4GB of RAM. That leaves us with just four laptops: the £1,150 Dell XPS 13, £950 Lenovo Yoga 720, £1,030 Asus Zenbook Flip, and £850 Acer Swift 3. 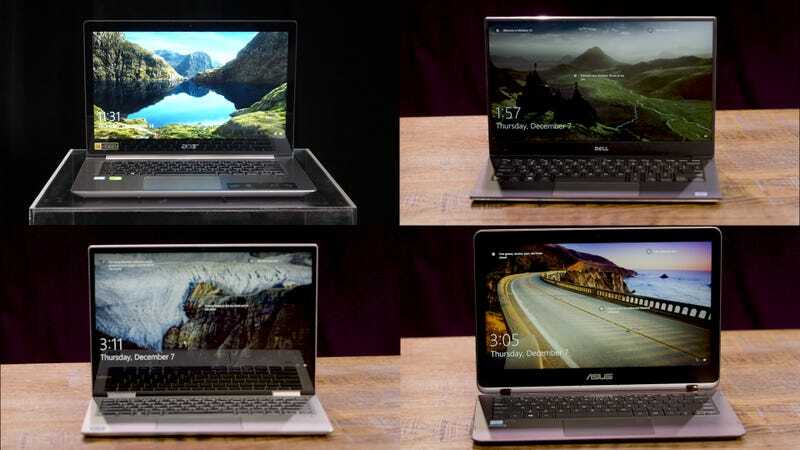 All four of these laptops have Windows 10 inside, at least a 13.3-inch display and 7th Generation Intel processor, and a price tag under £1,200. 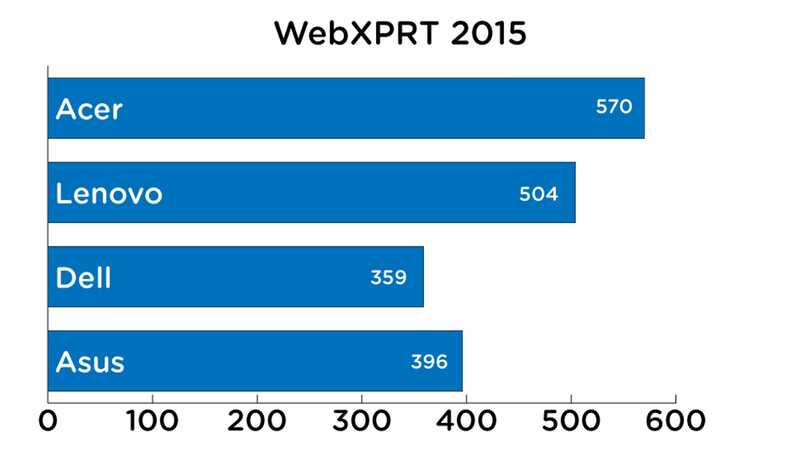 WebXPRT 2015 Score. Higher is better. Time to batch process images in Photoshop in seconds. Lower is better. Time between turns (in milliseconds) in Civilizations VI benchmark. Faster is better. 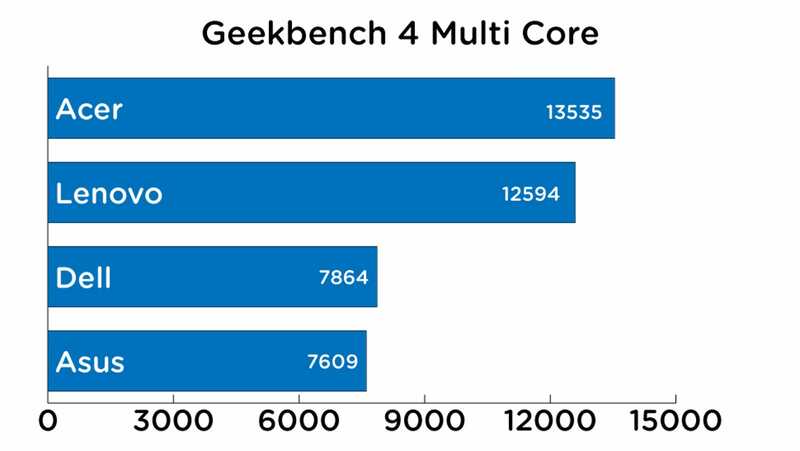 Geekbench 4 multi core score. Higher is better. 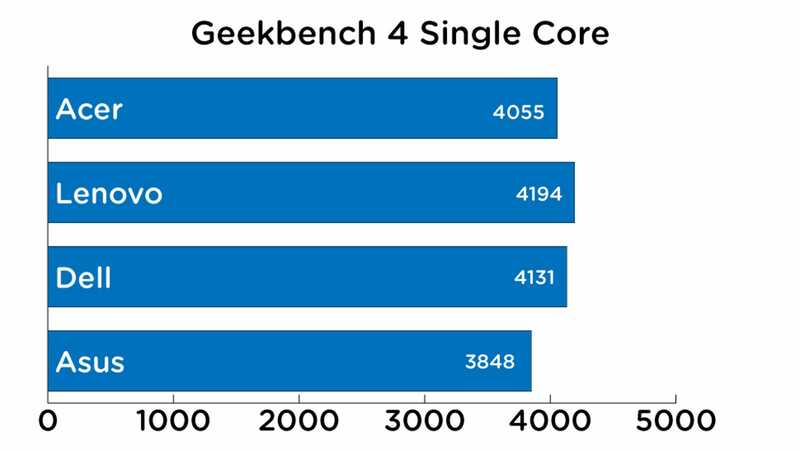 Geekbench 4 single core score. Higher is better. 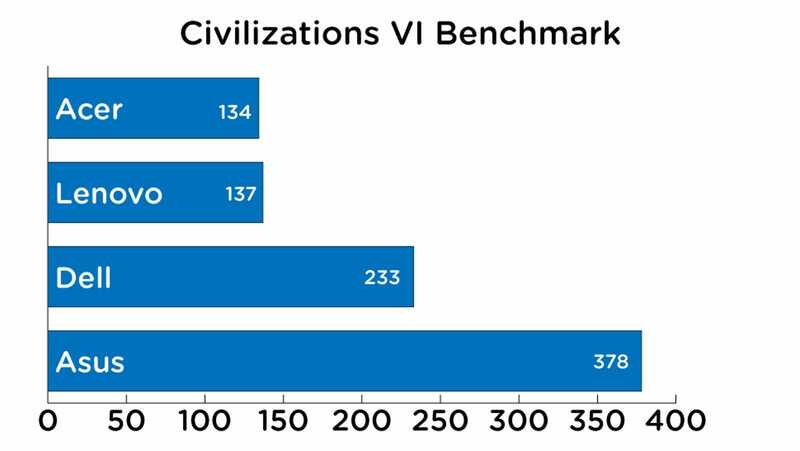 And they were only a few milliseconds apart in the Civilization VI graphics benchmark that averages the tim between turns in a game of Civ VI. To make sure the comparisons between the four laptops was as fair as possible, I used a colour meter to set the brightness of each one to 200 nits. I then streamed a video on a continuous loop. The laptops all used the same wi-fi and were all positioned next to one another during the test. 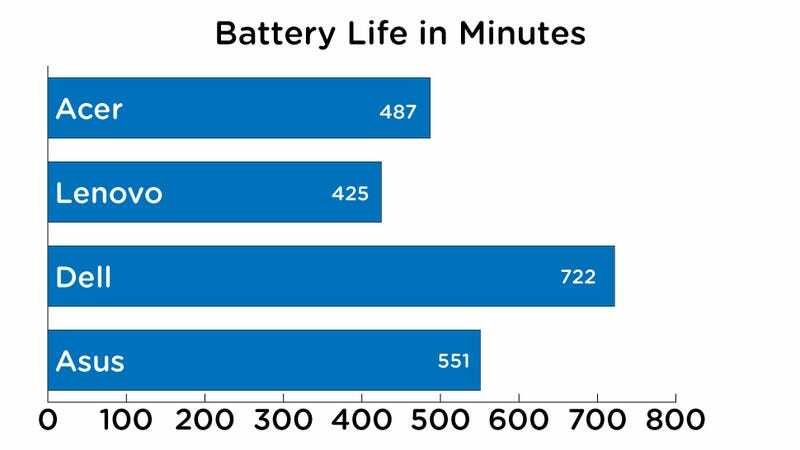 Battery life and speed are both crucial factors to consider when buying a new laptop, but, for me, what matters more, especially in a sub-£1,200 laptop, is design. It’s here where cheaper laptops really begin to falter versus their pricey competitors like the Apple Macbook Pro, LG Gram 14, and Razer Blade Stealth. Those laptops have an exceptional build quality. They feel sturdy and luxurious, light and slim. 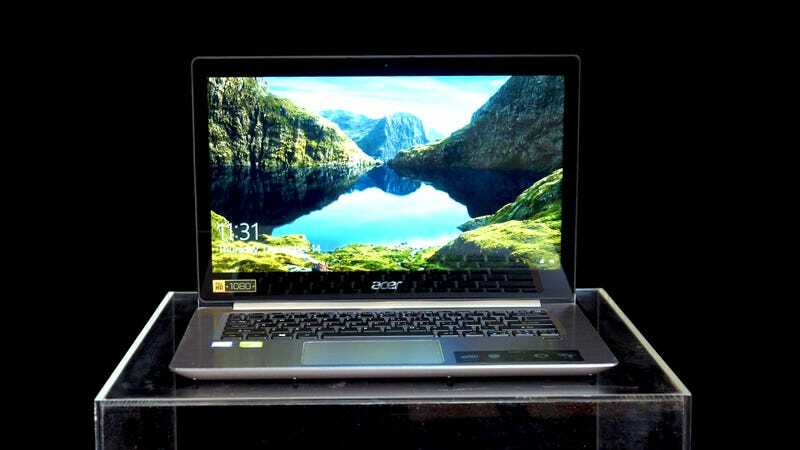 Which is why the hefty 3.97 pound Acer Swift 3 immediately lost. It’s a big laptop (owing partially to its 14-inch display), that I always, always, know is in my bag. And with a thickness of .71-inches it never feels sleek like the other three. It also feels cheap! The centre of the keyboard flexes when you press on it, and the hinge kind of flops when you give it a wiggle. 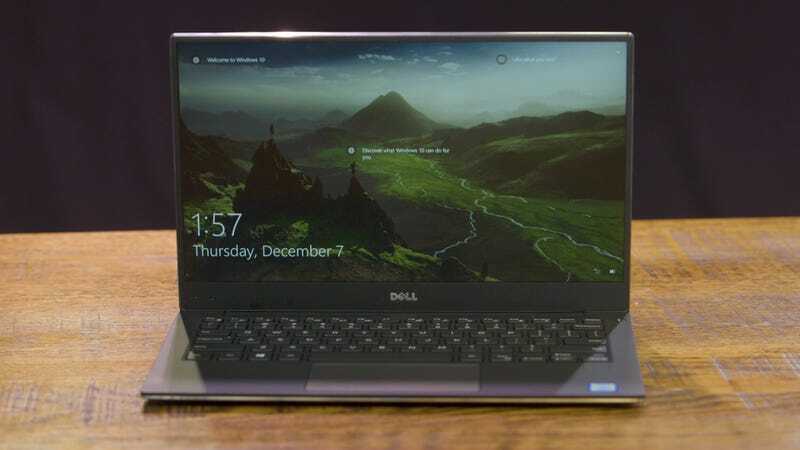 The Dell XPS 13 loses quickly on the design front too. But not because it feels cheap. 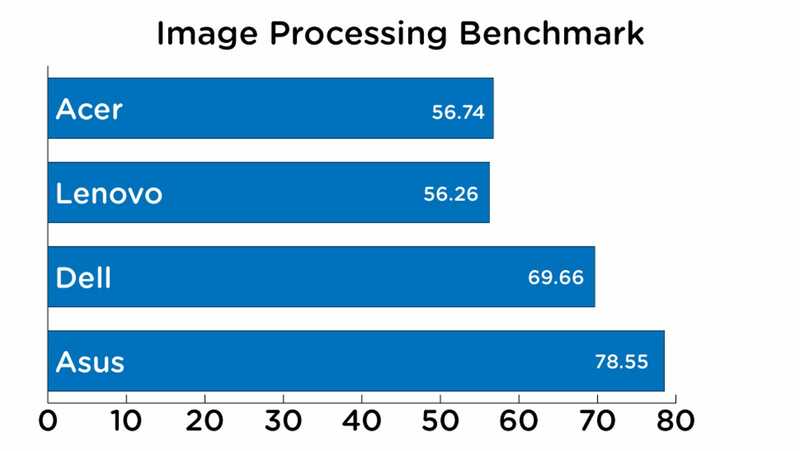 In fact the £1,150 Dell XPS 13 has a build quality every bit as good as a £1,600+ one, and it weighs just 2.7 pounds while being just .6-inches thick. This thing is also sturdy, with a virtually bezel-free display, great keyboard, and exceptional touchpad. But it (like the Asus ZenBook Flip and Acer Swift 3) uses a proprietary charger and that feels like a grave offence when USB-C is sitting right there. It might have the worst battery life, but it’s still pretty clear that the Lenovo Yoga 720 is the best laptop you can get for under £1,200. The Acer Swift 3, at £850, is the cheapest of the four... and it shows in all the wrong ways. It might be fast, but it looks and feels like a cheap laptop. Meanwhile the £1,150 Dell XPS 13 and £1,030 Asus Zenbook Flip feel outrageously expensive next to the £950 Lenovo Yoga 720. Yes the Dell XPS 13 has better battery life, and the Asus Zenbook Flip is thinner and lighter, but they’re also so much slower! The Lenovo Yoga 720 was the second fastest laptop, and it has, hands down, the best design of all four devices. Between those factors and that reasonable price tag, it is clearly the best laptop you can get right now for under £1,000. Buy it and have few regrets.